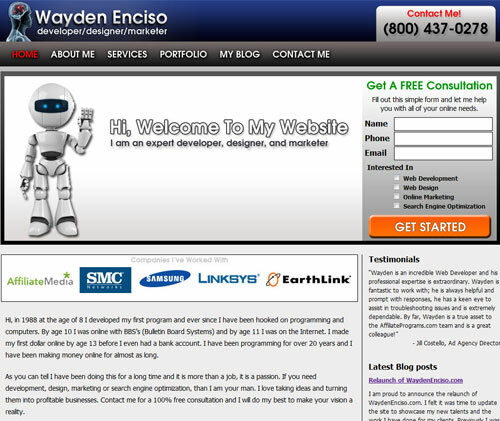 I am proud to announce the relaunch of WaydenEnciso.com. I felt it was time to update the site to showcase my new talents and the work I have done for my clients. Previously I was using a template to save time designing the site, but this time I took greater effort and designed 100% of the site. I designed the website with usability and conversion in mind. Usability is basically how easy it is for a visitor to use your site and find what they want. Many times people want to convey too many things on their website and it shows in the design. A cluttered and disorganized design is a real put off for a visitor and it could mean them leaving your site and finding one of your competitors. Each page of my website has a specific message and the design and content is used to support that message. Conversion on your website is a specific goal that you want your visitors to reach. The goal of my website is for potential clients to contact me. You should always be conversion-minded when you are building your website. I display my phone number clearly at the top, I have a contact form on the front page and under the contact section, and I have a Contact Me link in my top navigation. I hope you enjoy my website and I hope that if you are a potential client, that we can work together. Thanks!